The November block in our series is posting on the last day this month because of, well…. Thanksgiving. It being so late in the month this year has my blog schedule all amiss. But I digress.. are you ready to quilt? 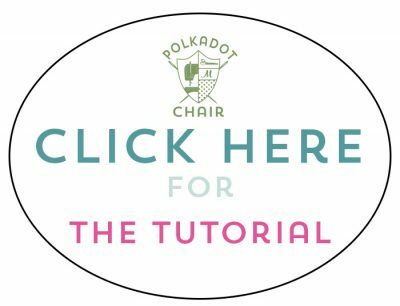 As a reminder this block of the month series is meant to help you learn to quilt one month at a time. 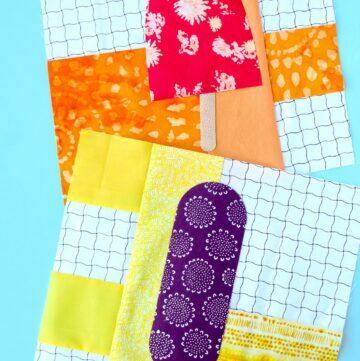 I don’t want it to feel overwhelming at all, and hope that it makes you WANT to create a quilt. Each month we add a new block and a few more skills. 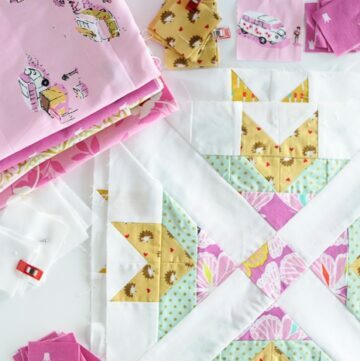 If you’re an experienced quilter then it’s meant to give you a fun and simple quilt project to do each month. This months block is a Star block, or more precisely a Sawtooth Star block. I have it stitched up in 2 different combinations to show you today. 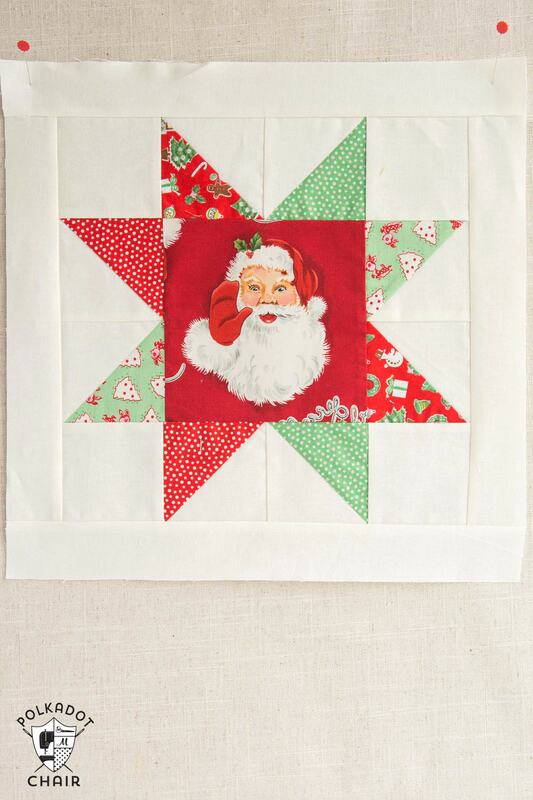 I could not resist this jolly Santa Claus print at JoAnns last week, and decided to make him the center of this months block. If you’ve been following along then you know that I’m working on 4 variations of the block each month. I’ll share the other two variations with you in December because honestly they are not even cut out yet, because, of well, Thanksgiving. 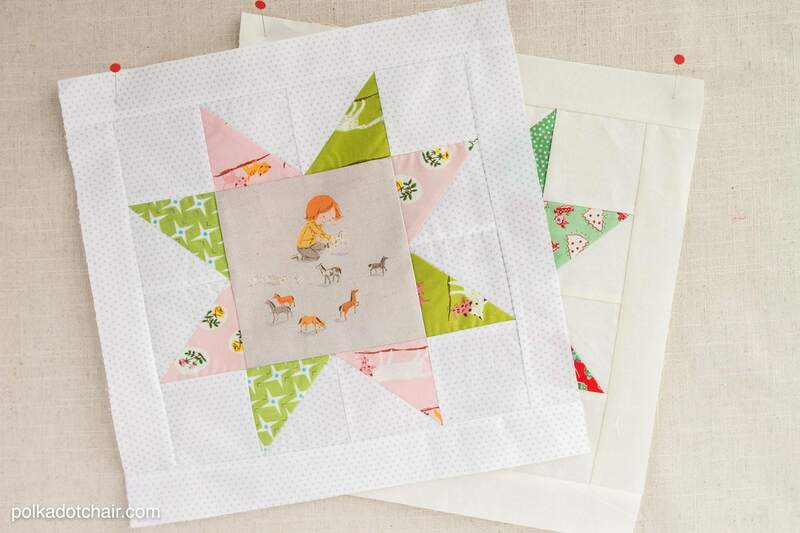 This block features a large center block that is perfect for fussy cutting. “Fussy Cutting” means to cutting out a specific motif or section of the fabric, it’s a great technique to use with novelty fabrics. I LOVE the Santa block! Could you please share what the other fabrics are that you used in it? I want to recreate it exactly and put it on my daughters bed for Christmas! When will you release December block? Looking forward to it. 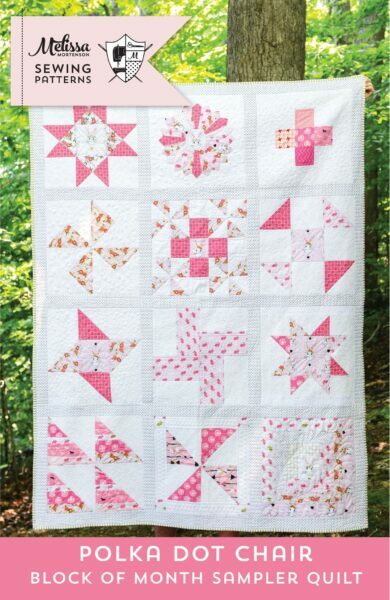 I like the hints and easy-to-follow/understand instructions for a new quilter like me. 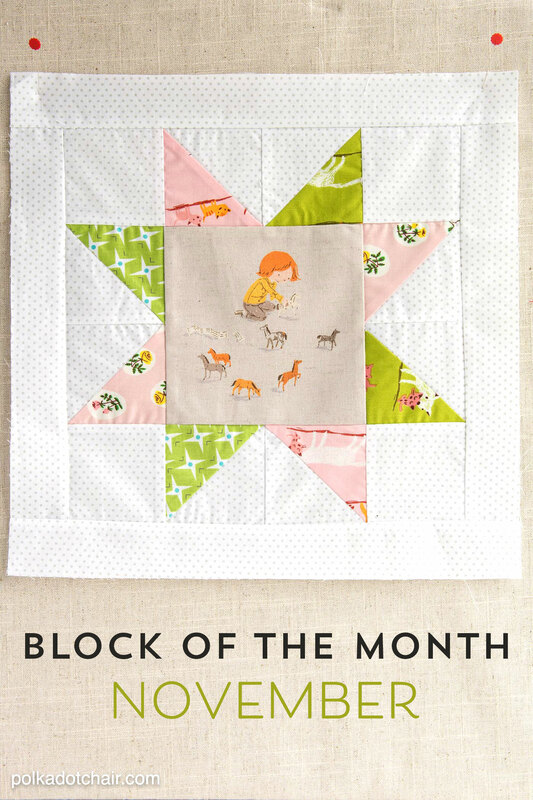 I’m confused as to how to find the first couple of blocks of this quilt block of the month. The blocks are pretty randomly placed on the blog. There is one block posted per month. In the article there is a link you can click on to see all of the blocks that have posted so far. 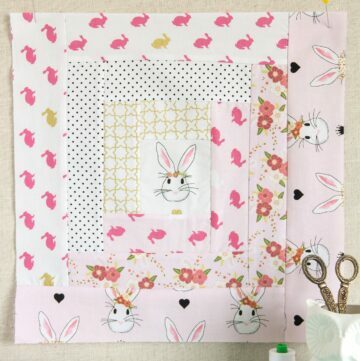 There are other sewing/DIY/craft projects posted on this blog during the month so the blocks are mixed in with the other content. 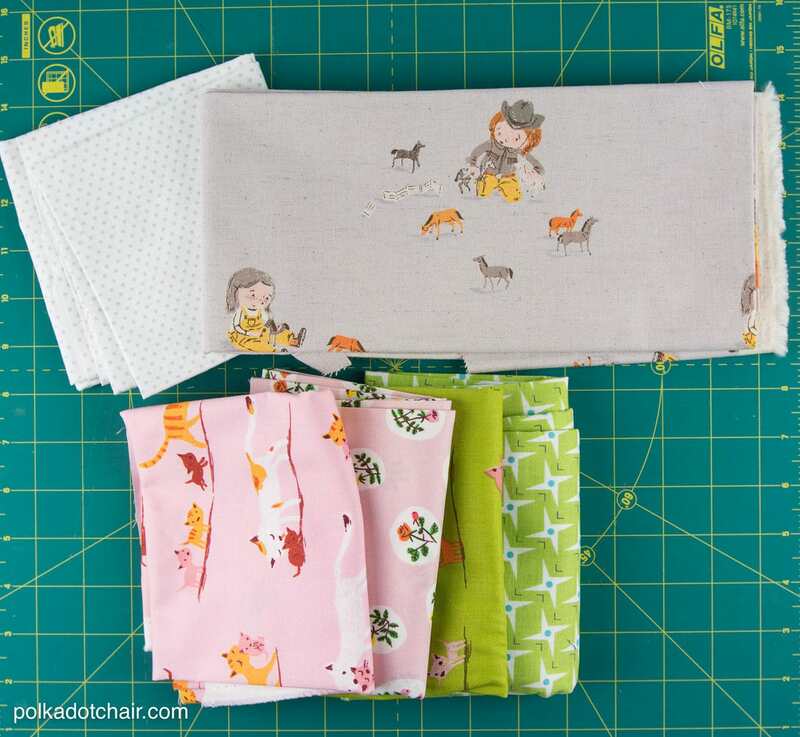 I love the fabric with the little girl and horses. 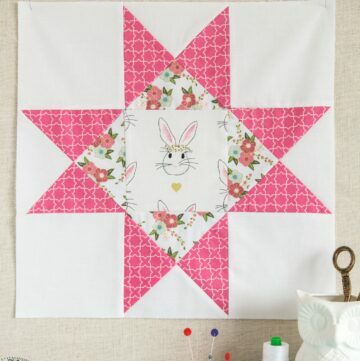 Where can I find this fabric and the others you used for this project?